there is no shortage of end-of-the-world movies, from blockbuster tentpoles like armageddon, knowing, and the devlin/emmerich disaster porns (independence day, the day after tomorrow, 2012) to indies (last night, the book of life, another earth, melancholia, 4:44 last day on earth). 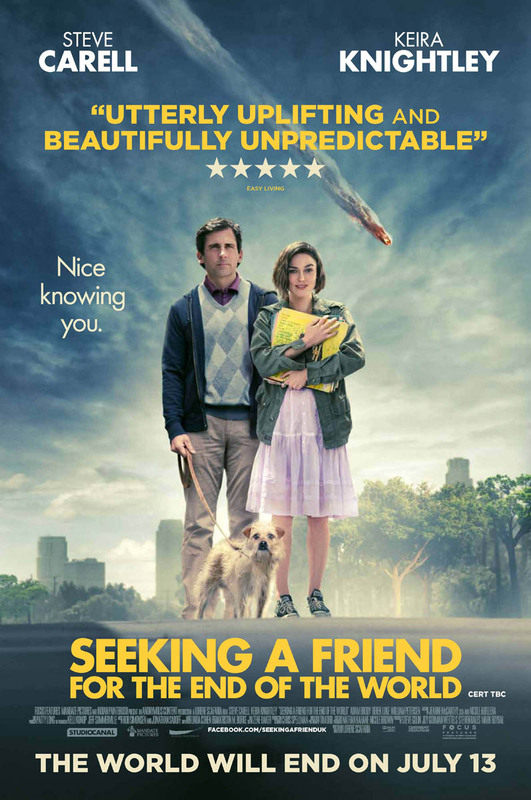 seeking a friend for the end of the world lands somewhere in between: not dumb enough as a cgi-driven spectacle nor profound and atypical enough for the indie crowd. written and directed by lorene scafaria, who adapted nick and norah’s infinite playlist for the screen, seeking a friend for the end of the world wastes no time to set things up. it opens with insurance salesman(!) dodge (steve carell) listening to the end of the world announcement from a classic rock radio station in his car with his wife (played by carell’s real life wife nancy walls). dodge’s wife ran from the car, literally. the radio station returns to music post-apocalypse-announcement with the beach boys’ wouldn’t it be nice. yes, it’s that kind of humor. worst of all, BRUCE’s team of drillers are nowhere to be found. on the other hand, there is no animal cracker scene here, or diane warren ballad. 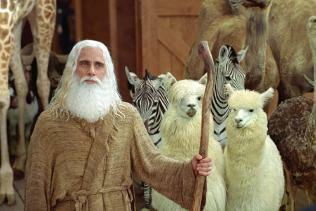 it is, however, probably the only movie to reference evan almighty. we also get glimpses of dodge’s home and work life. it’s nice to know that people still show up for work with the world ending in three weeks. there’s also a nice end-of-the-world party sequence hosted by his friends (rob corddry and connie britton). they try to set the newly single dodge with karen (melanie lynskey from tv’s two and a half men). also at the party is patton oswalt, the first of several cameos in the film, who’s not as funny as he usually is (best line: “i want to shoot up to radiohead.”). so far, so good, the tone is set for a deadpan comedy about people dealing with the end of the world. things get shakier after that when dodge has a meet cute with penny, the manic pixie dream girl neighbor played by keira knightley, who’s having problems with her boyfriend (adam brody from tv’s the orange county, cop out, jennifer’s body). penny is not only a pothead but also loooooves vinyl records. the humor from the opening scenes are gone and we are settling more or less into romcom conventions. and that’s not the only convention the film follows. like nick and norah (except nick is having a midlife crisis instead of emo pussyiness), the episodic film is eventually structured not just as a romcom but also a road movie in which penny wants to get home (britain) and dodge tries to find the one that got away, his high school sweetheart. 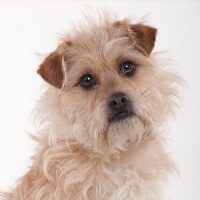 and yes, as you can see from the poster, there is a cute dog. on their journey, they get a ride from gil grissom himself, william petersen, as a blue collar guy who hired assassin to kill him before the world ends; gillian jacobs from tv’s community as a waitress of a t.g.i. friday type restaurant; parks and recreation’s jerry (jim o’heir) as a cop; derek luke from antwone fisher, david mamet’s spartan, and as p diddy in notorious as penny’s ex, a military man who has a bunker, video games, and several smart cars preparing for the apocalypse. lifting a subplot from deep impact, there’s martin sheen as dodge’s estranged father. 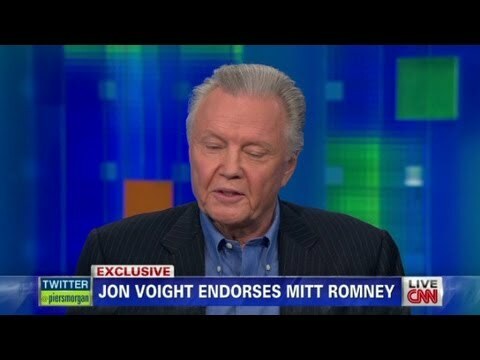 hey at least it’s not jon voight. there is no doubt that the film squanders its earlier promises. carell’s character is pretty much the archetype of the popular mid-to-late 90s corporate drone who suddenly realizes his life is empty white male as in everything from office space to american psycho to american beauty to fight club to the family man. except this time, the apocalypse is looming. it also takes quite a bit of suspension of disbelief to go with the movie. in addition to dubious character motivations, it’s hard to imagine that dodge’s coworkers, restaurant servers, police…etc would still go to work. it may have been a throwaway gag but there’s even a yard sale going on. but on second thought, and giving the movie the benefit of the doubt, it would perhaps be more outrageous to think that everyone would act logically and rationally with the world ending in a couple of weeks. but it’s not a movie interested in the technicality and mechanics of an apocalyptic scenario. it’s more about dodge and penny as characters with the apocalypse on the horizon. and on that front, it more or less succeeds. it’s not without flaws but nevertheless manages to wring out some emotional scenes. i could do without the police station and the beach sequences. 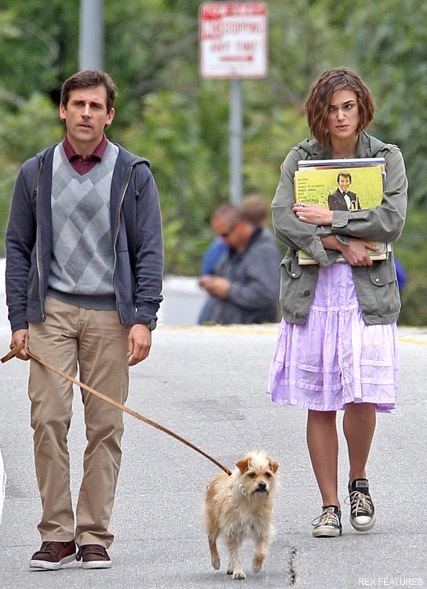 it helps that carell and knightley rise above the material they are given. though the movie is patched together from various conventions, it comes from such an oblique angle that if you like seeing carell and knightley on screen, you would be willing to forgive its shortcomings. p.s. 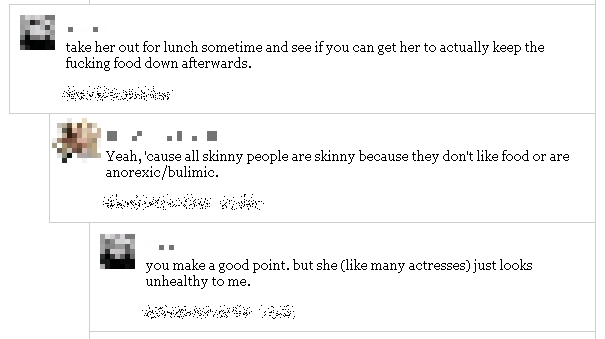 the internet seems to have a hard time with anyone being able to be healthy and skinny. there doesn’t seem to be any article about keira knightley without someone saying things like “someone get her a sandwich” or “give her a meal” type comments mentioning anorexia and bulimia. it is somehow relevant that this be brought up even though it has nothing to do with the quality of the movie. it’s nice to know that the public is so concerned with knightley’s (see also, angelina jolie at the oscar) well-being and eating habit. it would be wrong to mention weight and physicality whenever there’s a kathy bates or melissa mccarthy movie. no one’s making snarky comments telling them to put down the cheetos. so it’s equally wrong and unnecessary to point out the physical shape of a skinny person. it feels more like jealousy than sincerity, as if it’s unthinkable that anyone can be both healthy and skinny.